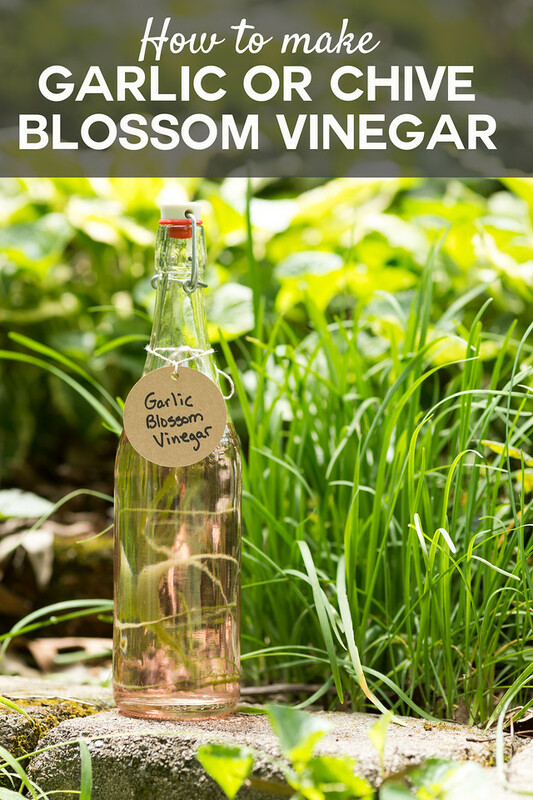 A few garlic or chive blossoms and some vinegar and a little time give you this amazing Garlic or Chive Blossom Vinegar! It’s great in vinaigrettes or to give as gifts! A few years ago while infusing some vinegars, I stumbled upon a chive blossom vinegar. I immediately fell in love with it’s soft lavender hue and promise of oniony tart goodness. When my CSA gave me a big gorgeous garlic blossom, I realized I could use the same technique to make Garlic Blossom Vinegar. 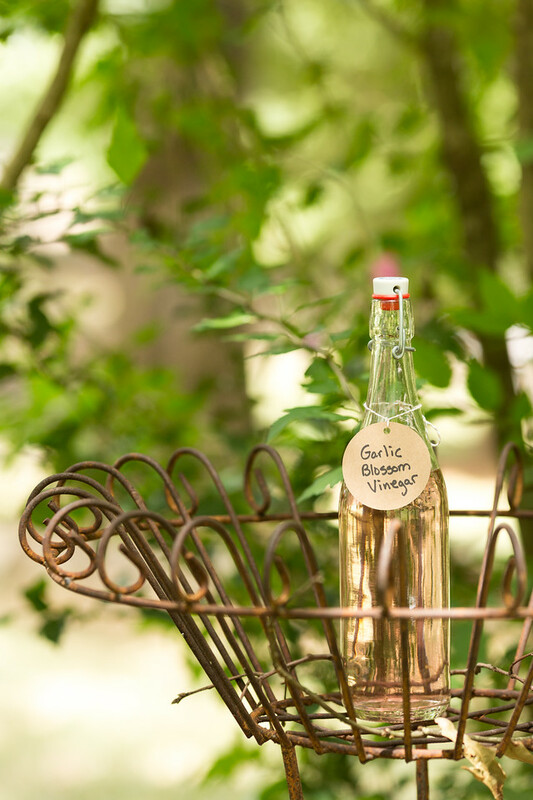 The main differences between Garlic Blossom Vinegar and Chive Blossom Vinegar is the size of the flower and the hint of flavor. Chives blossoms are smaller and give a deeper hue and your vinegar will have a hint of onion. Garlic blossoms are larger and your vinegar will have a hint of garlic. Both are amazing and you probably need both in your pantry, especially when you see how easy it is to make infused vinegars! 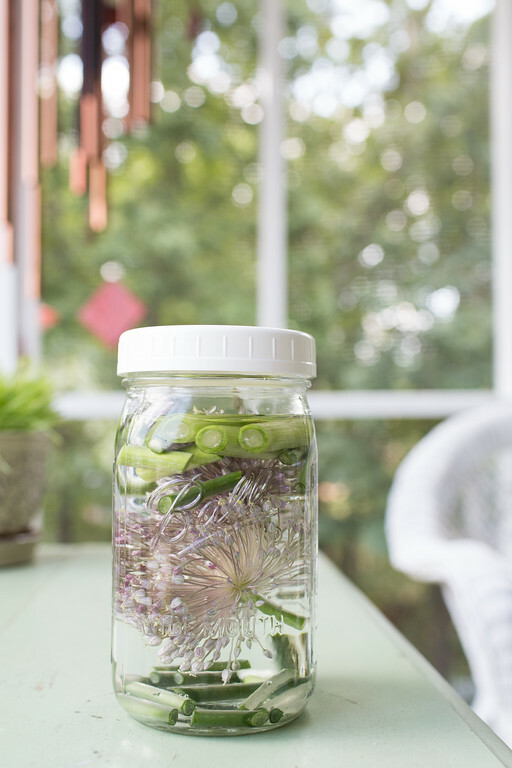 Making Garlic or Chive Blossom Vinegar is so Easy! All I did was chop of the garlic stalk and add it along with the flowers to two cups of vinegar in a mason jar with a plastic lid. Then I put it in a cool, dark place to age. Shaking it every day or so. After three weeks, it had turned that lovely lavender purple and had a soft garlic flavor. I’ve used this in salad dressing, drizzled on some grilled fish and it’s perfect deglazing a pan to make a pan sauce. Store it in a pretty bottle, it makes wonderful holiday gifts! 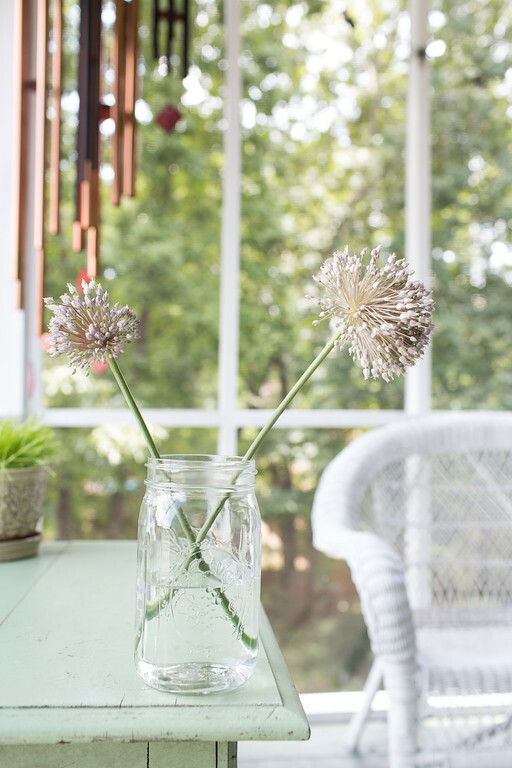 Another fun DIY with herbs is to make an Herb Salt, I think you could use the chives or the blossoms for it! Cut stems into 1 inch lengths. 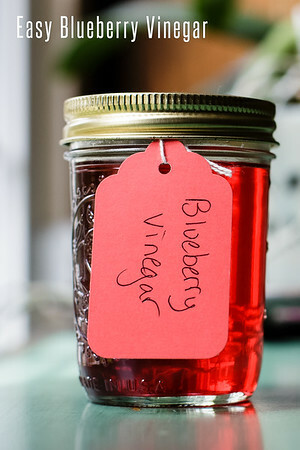 Pour 2 cups of white vinegar into a mason jar. Add garlic stems and flowers and seal with a lid. Shake and place in a cool, dark place. Shake every day or so. After 3 weeks, taste and if it is to your desired strength, strain into a pretty bottle! It just looks really nice and sounds delicious! This is a great pantry staple and so easy to make! Thanks for sharing! You really do photograph these maceratipns so well. A real talent! Have never ventured into making anything like that. Am not much of a cook anymore. Mr. does pretty much all of cooking since he retired which is fine with me. He’s actually a pretty darned good cook. I spend too much time reading blog posts, printing out ideas and patterns then making things or working on redoing furniture or few other handy things. Since all the kids (4) have flown the nest, Mr. retired, I can sew, craft, whatever with much of my spare time. We stay home a lot out in rural area few miles west of Grand Junction, CO.
Making flavored vinegars sounds interesting, how did you get into that? Is it hard to keep the plants alive to make vinegars? Sounds very tasty also. This vinegar is great! I can’t wait to make some so my salad dressing will shine! 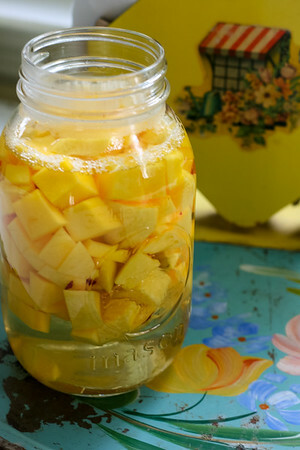 What a great Vinegar, it looks so pretty and I would love to try it! Thanks so much for sharing with us at Full Plate Thursday and have a great weekend! What a shame you can’t leave the blossoms in – they are rather pretty.